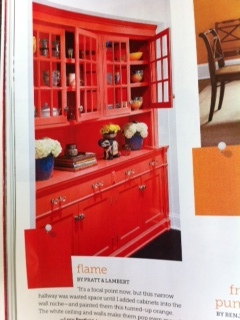 If you’ve read my past posts, you know that I love color in my house. If this is your first visit, you can read up on a couple of house posts here, or here, or here! And if you know my mom, you know this apple did not fall far from the tree! Therefore, we did some painting at her house in Oklahoma while I was visiting last week. 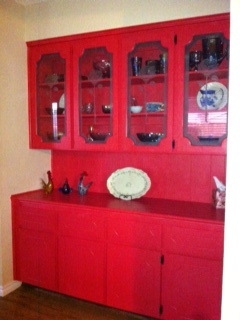 We painted the built-in hutch in her dining area. It was your standard, Plain-Jane stained wood from the 80’s. I know…I know…many of you think it’s horrible, and just downright unthinkable, to paint stained wood. But moma and I don’t! Color can do wonders for a room AND your entire being! Here is what it looked like before (minus the doors). It’s not quite this bright, but we were having a difficult time with the sunlight and my phone. But you can see what a difference it made! She loves it. 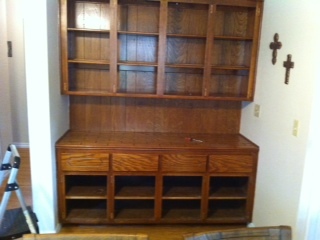 Before, the hutch blended into the floors and her dining room table. Now, it’s quite a statement! Never be afraid of color, especially if it makes you happy! As Mr. always says, “it’s just paint”. 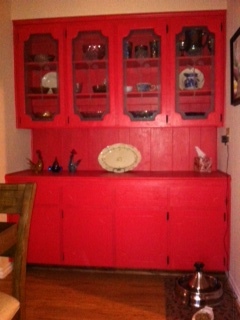 This entry was posted in DIY & Crafts and tagged color, diy, furniture, painting. Bookmark the permalink. ← Good Thing It Was Free!